Yet despite the ‘Before’ pictures of weeds and rubbish that accompanied last Saturday’s column, we still had about 40 people turn up for garden tours on the weekend. They must have been really amazed to find over 80 fruit trees and berry bushes in the ground along with extensive annual vege garden beds. Ross and I have saved the rest of you the trip by including before and after pictures this week, but I’ll fill in some of the highlights of what makes an eco-thrifty foodscape. This transformation took less than 4 months. The elements that determine our decision-making are: sun, wind, water, soil, materials and time. Of these, sun and time are the non-negotiables. In other words, wind can be tempered, water can be managed, soil can be amended and materials can be changed or replaced. By materials I mean garden infrastructure like edging, posts, fences, irrigation, etc. This transformation took 12 months. But the sun only follows certain paths in the sky and time waits for no man, woman or child. We cannot change them, so we have to design around them. The sun shines on certain parts of our section at certain times of year. 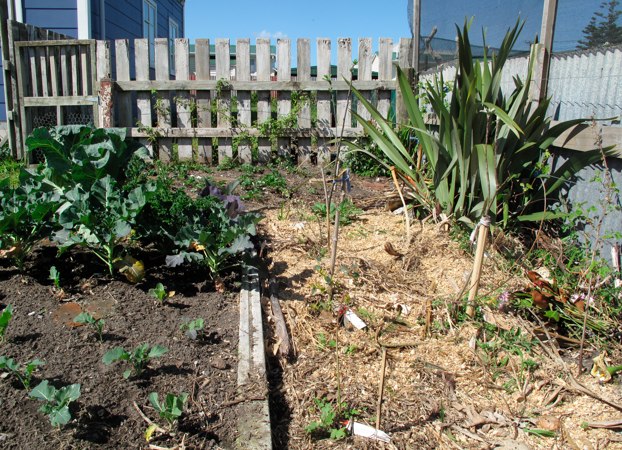 Understanding solar patterns, and summer and winter sun angles have allowed us to achieve both a warm, dry, low-energy home, and a compact productive foodscape. For example, in one corner of our back yard we have what I call ‘stadium seating’ facing northeast. 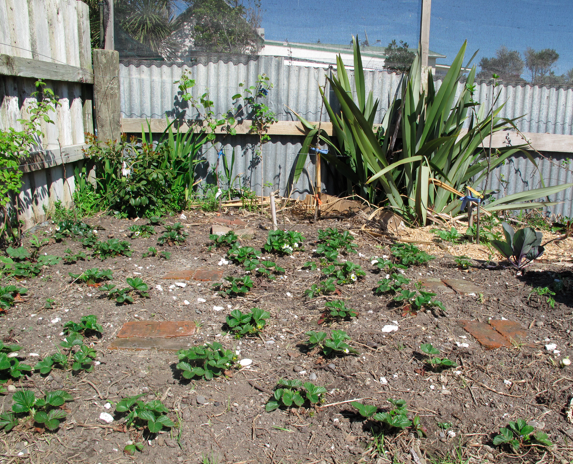 At ground level we have a large strawberry bed and annual vege garden. Behind and above those are five blueberry bushes, and then four dwarf apples and a plum. Behind and above those – trained on galvanized wire along the fence – are three grapevines and four raspberry canes. Although the perennials have not leafed out yet, you may be able to see the blueberries at the center of this picture, and apples, raspberries and grapes to the right. And in the corner is a red guava that is just loving its sun trap: fruiting three weeks earlier than my friend in Hamilton’s guava of the same variety! All this is in an area of about 15 square metres. Strawberries in the foreground, grapes and raspberries on the fence. You’ll have to have good eyes to pick out the apple and plum in this shot. The guava is in the corner in front of the post. Wind management means we planted fruit trees in the lee of the few native trees that were on the property or wind netting that we installed ourselves. Water and soil management go hand-in-glove, relying on a combination of purchased topsoil and generous amounts of compost. Since we are on sand, the silt and clay particles in the topsoil are better at binding both organic matter and water longer than sand alone. But instead of top dressing the entire property with topsoil, we concentrate it only around our food producing plants. This means all of our annual vege beds have 70 mm to 100 mm of topsoil, and perennial fruit-bearing plants are installed with 5 to 10 litres of topsoil in the hole around their roots. Although we have rainwater collection and mains, our primary water management tool is this targeted soil / compost mix. In terms of materials, I’ve already mentioned wind netting, which we use liberally. In some cases I have attached it to both sides of posts for double protection. Other materials we use are concrete fence posts (free from the dump), reused garden edging (online auction) and bricks (various second hand sources). We chose these materials because we did not want to use treated timber for organic gardens, and we could not source inexpensive untreated, long-life timber. Finally, although we cannot stop time or change it, we can design in four dimensions. Time is the fourth dimension. 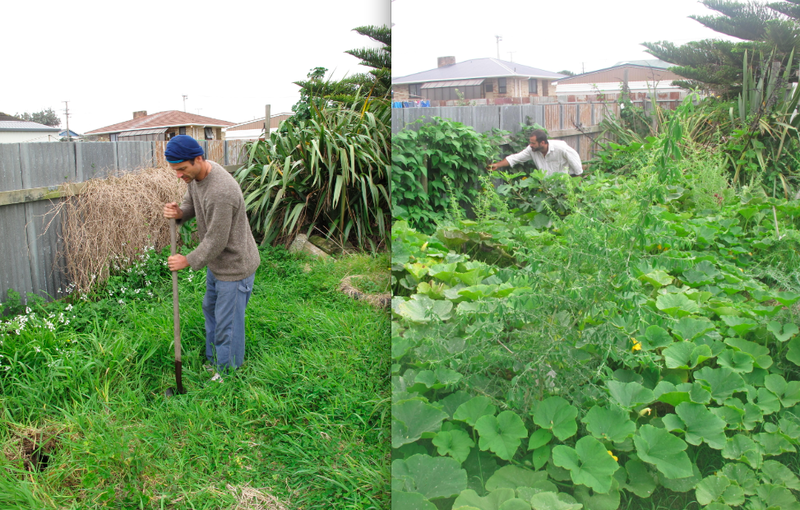 Designing in four dimensions means crop rotation in annual vege gardens, and may mean using nurse trees like tagasaste (tree lucerne) as companions for fruit trees. We also use timing with our chooks and ducks to mow our grass by ‘tractoring’ them in 2 m by 1.2 m wire mesh pens that we move every day. In the examples above, we are working with nature not against it, to minimize inputs and maximize productivity. You can learn more from a pair of workshops coming up the weekend of the 6th – 7thOctober. Whanganui Environment Base, 256 Wicksteed St., Wanganui.